Jay Ferguson, U.S. general counsel at one of the world's largest staffing companies, Randstad Staffing, took the leap in-house to head legal affairs of a Duane Morris client. Jay P. Ferguson, Jr.'s career at Duane Morris was very bright. In 2009, the then-37-year-old Georgia-native became a partner, was named by Atlanta Magazine as a "Georgia Rising Star" and was busy working on as many as seven or eight significant employment-discrimination cases for firm clients, including the global recruitment giant Randstad Staffing. Jay enjoyed the collegial atmosphere of Duane Morris' Atlanta office. He was known among the Atlanta partners as a "bulldog" litigator with a keen sense of detail and the ability to handle even the most complicated matters. Then Jay got a call that changed his career path. 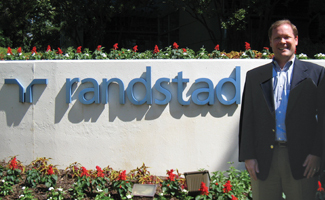 In June 2009, he left Duane Morris to become U.S. general counsel of Randstad Staffing. Under less-enticing circumstances, Jay says leaving Duane Morris would have been a difficult if not impossible decision, but as he explained to Spotlight, the prospect of steering the U.S. legal department at what is now the second-largest staffing company in the world and a major client of Duane Morris was clearly the right choice for him. Update: Jay Ferguson has been promoted to Chief Legal Officer of Randstad. Q: You joined Duane Morris as an associate in 2003, and though you had worked at another law firm before Duane Morris, you were a fairly new J.D. How did Duane Morris shape your skills or approach as a lawyer? A: While at the firm, I learned the importance of building solid client relationships and keeping clients happy. At Randstad, I deal with dozens of internal "clients" each day, and the skills I learned at Duane Morris help me service those clients. Duane Morris' Atlanta office has been servicing many of its clients for eight to nine years, which is a testament to the high quality of legal work being provided. Q: What was it like to come to work at Duane Morris each day? A: There was definitely a collegial atmosphere in the Atlanta office between both the partners and associates. There were get-togethers outside of the office. And everyone was very accessible to me. 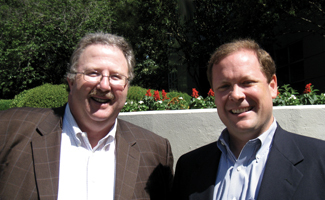 The current managing partner of the office, Woody Jameson, worked closely with me on several legal matters. His door was always open if I wanted to discuss professional issues. Q: What did you learn at Duane Morris that you have taken with you to Randstad? A: Randstad was one of the main clients I represented while at Duane Morris. Handling dozens of legal matters for Randstad enabled me to learn the company's business and establish significant contacts at the company's headquarters. It was great exposure for me. Q: What are some of the biggest differences between your day-to-day work at Randstad as general counsel and your work as a lawyer in private practice? A: During a typical day at Duane Morris, I normally worked on the defense of seven to eight different employment cases. At Randstad, I juggle the 400 or so legal and business issues currently on my radar screen. We have 300 branches across the United States, and each Randstad employee who contacts my department is asking what he or she perceives to be an important legal question. The challenge is ensuring that each request is responded to promptly with well-reasoned advice. I have learned the value of relying on trusted outside counsel such as Duane Morris for assistance. Q: Staffing is an industry that has faced challenges in the economic downturn. How did Randstad handle that? A: In 2008, the number of temporary employees who were placed by staffing firms in the United States decreased dramatically. Not only were companies laying off internal employees; they were also ending the assignments of contingent workers. Randstad met the challenge head-on and used it as an opportunity to examine whether it had the right people in place at the corporate headquarters and in the sales force. Recently, we've been on a hiring spree, seeking qualified sales people; and we have approximately 45,000 temporary employees on assignments in the United States each day. Q: How would you characterize the work that Duane Morris does for Randstad? A: The firm is currently helping Randstad with employment litigation, traditional labor work, numerous real estate matters and some corporate work, as well as patent and trademark advice. This week alone I spoke with four different Duane Morris attorneys. At least every other day, I talk to a Duane Morris attorney. It's an invaluable relationship. Q: What is it that makes the relationship between Duane Morris and Randstad strong? A: Duane Morris attorneys provide well-reasoned legal advice in a cost-effective manner. I'm not receiving bills from the firm that contain fluff or time entries that cannot be justified. I feel like I'm getting considerable bang for my buck in the form of legal services. I have solid relationships with [Atlanta partners] Terry Finnerty, Kirk Domescik and Woody as well as [Philadelphia partner] Tom Servodidio. If I called those attorneys and said, "Let me bounce this issue off you and get your off-the-cuff answer," I don't think Randstad would be billed for that call. They are more interested in preserving a long-term client relationship. Also, Duane Morris is a Randstad client, and that reciprocal relationship is important to me. Q: What has been the most interesting or valuable experience at Randstad? A: In 2010, Randstad rolled out a worldwide antitrust compliance policy. I worked with the company's attorneys in Amsterdam, the Netherlands—Randstad's worldwide headquarters—to develop the U.S. policy, and was charged with providing antitrust training to Randstad's 1,200 U.S. employees. I traveled across the country last summer to conduct these training sessions. Providing the training was a positive experience for me because it enabled me to spend quality face-to-face time with our nationwide sales force. A: I enjoy playing golf and spending time with my wife and kids. I have a 12-year-old son, a two-year-old son and a four-year-old daughter. I went to the University of Georgia (UGA), so I also enjoy watching UGA in any team sport, particularly football.